Marvel claims to have a stable of more than 9,000 characters and they are doing their best to Ravage the Fantasy Comic League Appearance category with them. After a month of gorgeous group shots and gang-ups, the Fantasy Comic League decides to establish a guideline for the characters they track. 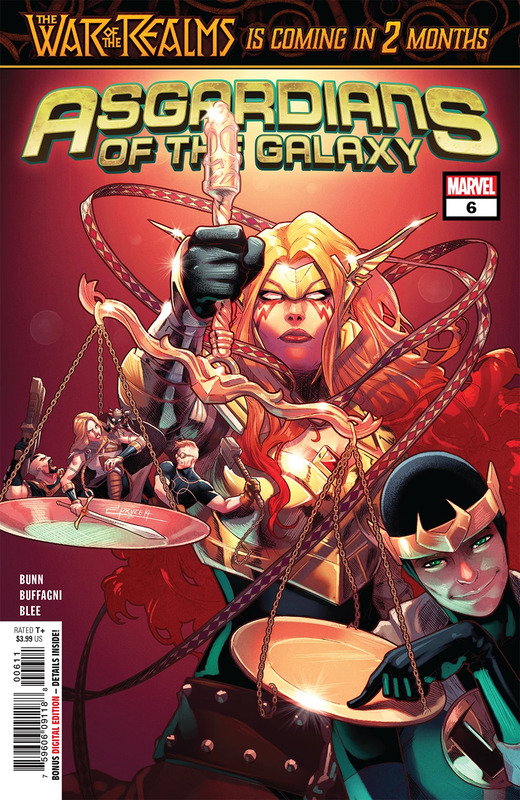 So despite several of Yondu’s Ravagers being deemed Not Ready For Primetime Heroes (looking at you Torgo and your 26 appearances since your 1969 debut in Fantastic Four #91), Asgardians of the Galaxy still manages to secure the top book of the week with 52 review points. If a character fails to meet the minimum 36 appearances in their publication history, a case can still be made for their importance, as is the case for Sera, Angela’s love. The Shadow Colonel, the Avengers’ latest adversary, also gets a free pass for his perceived importance as an antagonist despite making his first full appearance in this week’s Avengers, a book which totaled 33 points. Uncanny X-Men features a few Reavers not quite ready to be considered members of the varsity squad, but Donald Pierce, Bonebreaker and Skullbuster, the more well-known cyborgs help the book take the top spot for characters featured in a single issue. Sixteen characters score a total 45 points, impressive for a title whose main focus is the reunion of Cyclops and Wolverine. The Champions also score 45 points in their latest issue, including some Character Developments for Ms. Marvel and Viv’s death and resurrections. Outside of the Uncanny title, the rest of the X-Men are living in the Age of X-Man. The Marvelous X-Men, the event’s first tie-in series, focuses on Colossus, Jean Grey, Magneto, Nature Girl, Nightcrawler, Storm, X-23 and X-Man, the prime X-Men team in this loveless world. Their book notches 42 review points. The “Old Man” universe grows a bit larger with the start of the Old Man Quill introducing the alternate timeline’s version of the Guardians of the Galaxy and 26 points. Even though its their first appearances, the ragtag bunch of retirees get points thanks to the growing influence of that timeline.